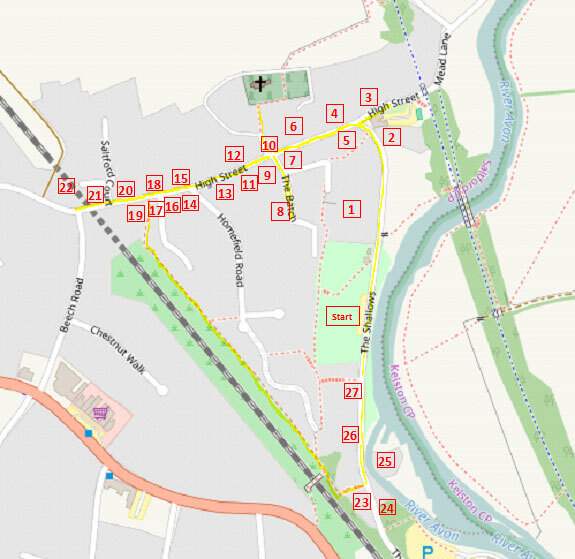 This walk explores the old village of Saltford that makes up the Saltford Conservation Area. Within this area there are over 20 listed buildings. 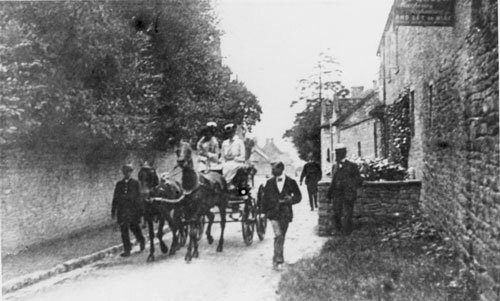 Further information about many of the buildings in the village may be found in 'A Village Called Saltford' by Hilary C. Smedley (2012) and 'A History of Saltford Village' by Percy Sims (1976). Start point: The Shallows car park. 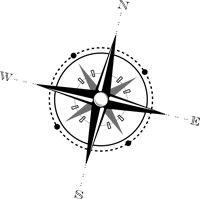 Distance: 1.5 miles, circular walk. Going: Easy. Some steps in the middle. Facilities: The Bird in Hand; toilets at The Shallows. Walk along The Shallows towards the village, with the river on your right. Looking slightly to your left on the hill you can see the Rectory (1) in the trees. This was built in 1814 and had 13 acres of glebe land (land owned in order to provide income, to pay parochial clergy). Now a private house, and Grade II listed, it was still in use as the Rectory for St Mary's Church until the mid-1980s. As you reach the top of the hill there is a large 18th century house on your right (no. 56 High Street) (2). Originally named Avon Cottage, it contained 2 parlours, a kitchen, 5 bedrooms, a wash house, bake house with ovens, large storerooms, underground cellars, coach house, stable, greenhouse and orchard. Some cottage. In the 1880s the front of the building became a grocer's shop, and then after a long period as a private residence after 1890, it became a draper's shop from 1923 to 1947. Bird in Hand, High Street, Saltford, in the (est.) late 1920s. The LH annex with the curved roof was the Tea Rooms. The Bird In Hand is attached to Avon Cottage. It was originally two thatched cottages, known as Holbrook's Cottages. With the arrival of the Midland Railway line from Mangotsfield to Bath in 1869 the cottages were altered and converted into an inn. On the opposite side of the High Street to the Bird in Hand are three early 18th century cottages (3), somewhat concealed in the trees (nos. 61, 63 and 65), the latter detached from the other two. Known as Hillside Cottages, they are all Grade II listed. No. 65 is described as 'a good example, relatively unaltered externally, of a modest early C18 vernacular cottage built to a standard plan'. In 1861 they were lived in by a labourer, a stonebreaker and a farmer respectively. A little further down the road, and just before the railway bridge, is an old farm on the left (Hillside Farm) that was lived in in 1861 by Jonas Smith, a farmer and butcher, with 30 acres of land. This building subsequently became a butcher's shop for many years before reverting to a private house. Walk up the High Street past the terrace of 5 houses on your right. South View House (4) (no. 45) was originally a thatched farmhouse with a yard and cow houses, built around the middle of the 17th century, and much altered since. By 1854 it was inhabited by a grocer and beer retailer. By 1891 a George Mitchell was living there with his wife and family. He is described as both a jobbing gardener and a general shopkeeper. 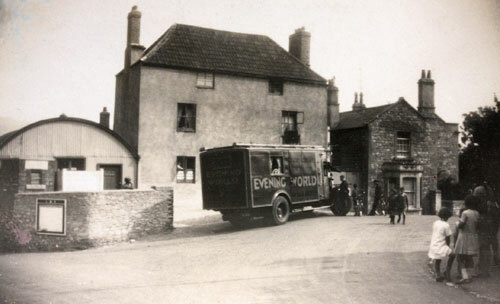 In 1894 the Post Office was transferred to South View House for just two years, from its previous location on the main road near the Ship Inn, prior to another move to The Brassknocker in 1896 (see later). After George Mitchell died, his wife carried on as shopkeeper (tobacco and sweets), followed by their daughter, Miss Mitchell ("a large lady with a moustache") who sold sweets during the second World War. Opposite South View House is a row of three originally-thatched cottages dating from the very early 17th century. In the mid-19th century these were known as Doveton Cottages (5), after a John Doveton who lived in one of them. Later they became known as Upper, Middle and Lower Cottages. There used to be a well in the garden of Upper Cottage, a feature of many of the old houses in the village. Continue up the High Street. On the right hand side, opposite a pair of semi-detached late Victorian villas, is a terrace of c. 18th century cottages with long front gardens (6). Once owned by the Goodhind family these have variously been known as Tunstall's, Dunstones, Holbrooks Cottages and most recently The Rank, Church Rank or Church Cottages. In the first part of the 20th century there was a corrugated iron 'reading-room' in front of Church Rank, next to the High Street. It can be seen in photographs of The Brassknocker and on old Ordnance Survey maps. Reading Rooms were built in villages across England during the late 19th and early 20th centuries, set up by local landowners and the clergy with a view to educating and entertaining working men and boys, and to keep them out of the pub! Daily and local newspapers were provided, along with recreational activities, particularly in the winter. Between 1946 and 1960 it acted as the Saltford Boy Scouts' H.Q. Next, on the left, is The Brassknocker (7). This 3-storey Grade II listed house was built in 1747 on a piece of land known as Green Batch, and was originally called Mount Cottage. At some time after 1870 it became The Brassknocker Inn, and subsequently (perhaps concurrently) became a grocer, butcher and finally, in 1896, became the village Post Office until 1947. A short detour to your left takes you into The Batch. Carry straight on for about 50m. On your right is another Grade II listed building known as Cherry Farm (8), dating from the 17th century. Like all the buildings from that period it would have been thatched. There were formerly a further three thatched cottages in The Batch - down the lane on your right as you return to the High Street. On your left on the corner of The Batch and the High Street are Church View Cottages (9), built about 1745, and owned by Thomas Goodhind in 1748. There were three of them, but they have been converted into a single home. Opposite is Queen Square (10), once the centre of village life, and located conveniently by the school, the church, the reading-room, and The Brassknocker (inn, shop, post office). It also acted as the children's playground, and was used by the Salvation Army and other religious bodies for their meetings. The square had a drinking trough, and the village pound (animal enclosure) was located there. Beyond the square a footpath leads to St. Mary's Church, another Grade II listed building, which has an Anglo-Saxon base to its tower and an octagonal Norman or perhaps Anglo-Saxon font. The pulpit is Jacobean. The church is well worth a visit. Straight in front of Queen Square is the entrance to Saltford Manor, a Grade II listed building of Norman origin, which is thought to be the oldest continuously occupied private house in England. The house was built on the estate then owned by the Earls of Gloucester and previously owned by Geoffrey de Montbray, the Bishop of Coutances (Normandy) and is thought to have been associated with Keynsham Abbey. There is a carved Norman window (1148) (which is round the back of the building), and there are features from all the centuries since, as alterations were made to the building. Of particular interest are 13th century wall paintings - possibly the oldest domestic wall paintings in England. One is of the Madonna and Child, and the other of a Saint, or perhaps a Medieval royal figure. A black and white photograph exists of a third painting - a wheel of fortune - but this was in poor condition and has since been covered up. You can see photographs of the murals and other parts of the house by clicking on this link: Saltford Manor House. 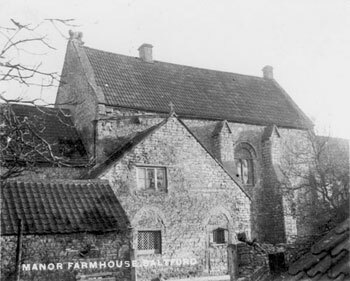 The Manor went by many names over the years, including Court Farm and Manor Farm, and it is only comparatively recently that it has been known as Saltford Manor. A recent owner, James Wynn, wrote an informative and entertaining account of his renovation of the building after 1997 in "The House That Jack Built - and the people who lived there" - well worth a read. The Church Hall, then Queen's School, in the early 1900s. Beside Queen Square is St. Mary's Church Hall, formerly Saltford School. Originally there were three old cottages here called Gray's cottages, but they were demolished to make way for the first school that was built in 1847. 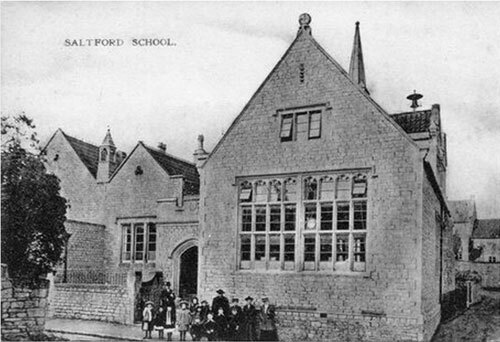 In 1874 the old school was also demolished and replaced with the present building, funded by Juliana Kelly, widow of Admiral Kelly of Saltford House (of whom more later). The clock commemorates the coronation of King Edward V11. The school was extended again in 1901. In 1939 a hundred evacuees came to the village from London and were assimilated into the village and the school. In 1961 the school moved to its current location in Claverton Road. Next on the left is Fernbank (11), a house set back from the road. This marked the site in the 17th century of the Poor House - originally 3 cottages known as Fir Cottages. This was a heavy burden on the Parish as many households were exempt from tax due to poverty. In 1615 care was given to two widows with ten children. Care was continued by the Parish Council until 1838 when the Keynsham Union Workhouse was built. Rose Cottages, next on the left, share a common porch, and are from the 18th century. Just beyond them on the opposite side of the road are Collins Buildings (12), 5 cottages (now 4) dating from the 17th century, sharing a common entry path. Behind the wall on the right beyond Collins Buildings is Springside House, a Grade II listed farmhouse from 1684 built by Thomas Goodhind. House & Rose Cottage, 1901. Opposite this is Norman House (13), named after a wealthy farmer, George Norman. The first house was built around 1600, but what we see today is thought to date from the late 17th century. 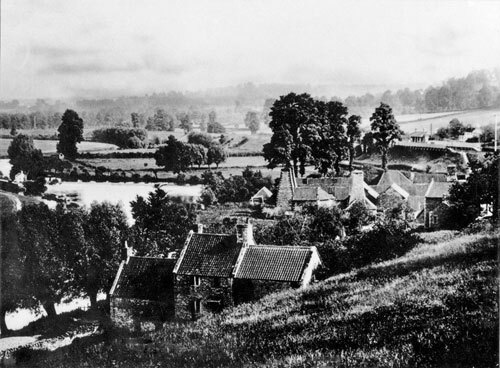 The property included granaries, stables, cow sheds and stalls, etc., and formed a part of the Norman Estate, which extended over all the land behind, as far as the Turnpike (now the A4), including the Turnpike House, the Ship Inn, all the land in the vicinity of the Shallows and Cox's Close, and the land where Homefield Road and Homefield Close are today. The modern house next to Norman House - Penwell - was built on the site of the orchard for the Poor House. Just beyond Norman House, on the right hand side of Homefield Road, there are some old converted farm buildings, including an old barn, which probably formed part of the Norman House farm 'barton' - or yard. Norman House together with the wall in front of it, is Grade II listed. Metz Cottage (14) on the left after Homefield Road, is thought to date from the early 17th century, and was once a farm with a stone courtyard and lands behind. Opposite Metz Cottage is Jeffrey's Lodge (15), another property once owned by the Goodhind family, when it was a farmhouse called Barton Court. 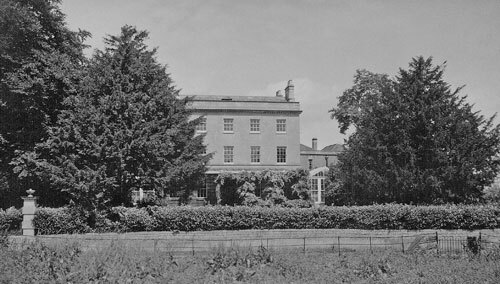 Later it was extended in front in Georgian Style, and became a gentleman's residence called Avonside. The stone gate pillars are Jacobean supporting balls of stone, indicating it was the residence of a magistrate. This may explain its long room at the back known as the Justice's Room. Judge Jeffreys is said to have stayed here during the trial of rebels in 1685 ('The Bloody Assizes') after Monmouth's Rebellion, though evidence for this seems to be lacking. The gate to the left of the building leads to Bel's Barn, shown on the 1837 Tithe Map as 'Barton Court and outbuildings' - part of the original farm. 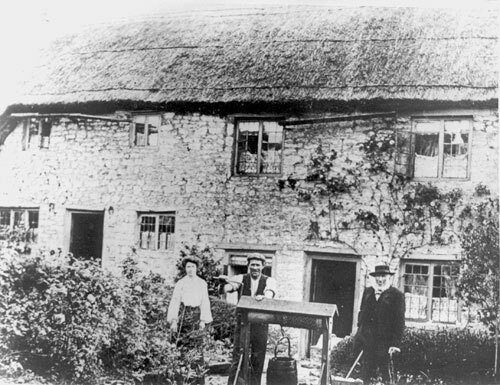 Thatched Cottages at 20-22 High St. Saltford, 1900. Back on the other side of the road, and opposite the well, are two c. 17th century cottages (16) at right angles to the road - nos. 20 and 22. Like most of the old village houses these were thatched up until the early 20th century, giving a very different appearance. In 1975, no. 22 was a shop - 'A.E. James, Fresh Fruit, Vegetables and Sundries', with daily deliveries. Beyond these is a house (no. 18) that was once The Railway Inn (17). Probably built in the early 17th century, this was a large farm with outbuildings. When the Great Western Railway was being built from 1836, it became the Railway, or Railroad, Arms, and at least 20 navvies slept in the long attic room at the top of the house. Opposite the Railway Arms is a terrace of four cottages known at one stage as Norman Cottages (18) (nos. 15-21). These were probably built in the late 18th or early 19th centuries, and in 1861 housed a shepherd, a laundress, two agricultural labourers and their respective families - 20 people altogether. 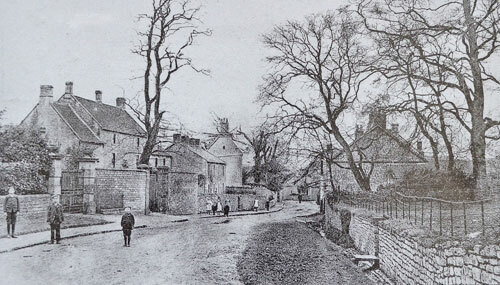 Opposite, on the left are three cottages probably dating from the early 19th century known as Walnut Cottages (19). These were built on a piece of land previously called Mallows Orchard. No. 14, the middle of the three was a grocer's shop first recorded in 1894. In 1894 it was taken over by Arthur Batstone, and by 1935 was called 'Batstone and Williams, High Class Provisioners'. It then became Garlands, and finally the 'Village Stores' under the proprietorship of T.G. & P.M. Pettitt by 1975. They still boasted daily deliveries. On the opposite side of the road is a row of houses, nos. 5-13 (20), all Grade II listed. Nos. 5, 7, and 9 are from the early 18th century, and at the time of the Tithe Apportionment of 1837 were described as a 'malt house, dwelling house, outbuildings and court'. In 1861 the (female) resident was still described as a maltster. Around 1880 they were remodelled, and the further two cottages - nos. 11 and 13, were added, and they were renamed 'Maud Buildings' after the owner's daughter. 11 and 13 are also Grade II listed. to Saltford House (not in view) is on LH side of picture. Further up on the right is the 18th Century built Saltford House (21), and described as 'severe late-Palladian style in the manner of John Wood the Younger of Bath' and 'a good example of a late C18 house with some original features'. It has had various occupants over the years, but perhaps the most celebrated is Admiral Benedictus Marwood Kelly, who purchased it in 1856. He died in 1867, but his second wife, Juliana, continued to live at the house until her death in 1896. In October 2016 local MP Jacob Ress-Mogg unveiled a blue plaque commemorating Kelly's residency in the village which you can see on the gatepost. You can learn about Admiral Kelly's fascinating life story on our website from this link: Admiral Kelly. 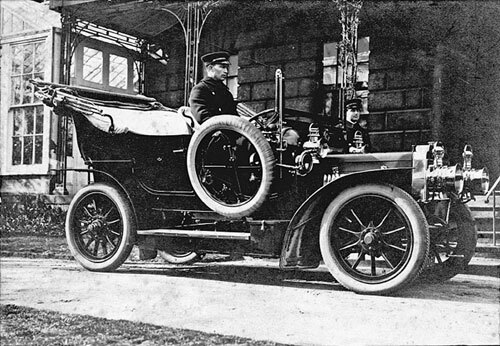 The 1906 Bristol Touring Car, registration plate AE 1061, owned by Colonel Rolleston photographed when the car was brand new with the Colonel's chauffeur, Frederick William King, sitting at the wheel. The next occupant of Saltford House was Colonel Rolleston, who was there from 1898 until his death in 1921. He had the first motor car in the village, a Bristol AE106, which you can still see in the M-shed museum in Bristol. After another few changes of ownership the house was bought by Keynsham Hospital in 1953 as a nurses' hostel. It now comprises three separate homes. The land directly opposite Saltford House, now occupied by two bungalows, was known in 1837 as the 'Pleasure Ground' and continued to be used for village functions up to and beyond Juliana Kelly's time. 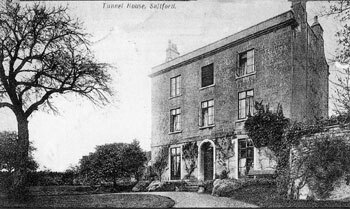 Tunnel House, previously known as "The Villa", Saltford. Next on the right is Tunnel House (22). This was built in 1744, probably for the Reverend Haviland John Hiley, Rector of Saltford between 1712 and 1754. It has gone by various names over the years, including Saltford Villa, The Villa, Tunnel Cottage and Tunnel House. In 1836 it was bought by Isambard Kingdom Brunel, the famous engineer who built the Great Western Railway. Brunel built Saltford Tunnel directly under the house and it still carries the GWR mainline railway today, hence the name. The house has since been the residence of a number of characters, used for offices and has been run as a guest house and small hotel. It has been a private home since 2006, when much of it was restored. It is Grade II listed. At the junction of The High Street, Norman Road (formerly Boyd Lane) and Beech Road (formerly Crown Lane) is the War Memorial, erected in November 1920. Its original location was in the middle of this road junction, but it was moved after a car had damaged it. Walk back down the High Street to the public footpath (25) that goes off to the right between Nos. 16 and 18. This is The Mallows, a public footpath that used to go across the field to the top of Bath Hill, but was re-routed by the side of the railway cutting and across the railway by a footbridge. Follow the straight path for several minutes and just past the bridge over the railway (that leads to the A4 at the top of Saltford Hill), turn sharp left, over the stone stile, and down the steps to the road at the bottom. Turn left along the road. The path you were on used to continue straight on down a steep hill to the eastbound platform of Saltford Station. The steps down to the road were known as Pump Steps. At the bottom was one of the village pumps that supplied the Mill Cottages and others with water. Immediately to your right are the Grade II listed Mill Cottages (23) (2, 3 and 4 The Shallows). These are from the 17th century, and pre-date the brass mill building. They probably housed workers in the then existing fulling mill, though cast slag block quoins in the walls suggest C18th or C19th reconstruction. The owner of no. 2 says (2016) the fireplace stones are said to have come from a dissolved nunnery. On your left is 6 Mill Cottages (24), recently renovated. This was built slightly later than the others - probably early 18th century. It too is Grade II listed. It also housed mill workers in the heyday of the Brass Mill. It was considerably extended in the 1970s. Re-trace your steps and continue along The Shallows to the Brass Mill (beyond 'The Old Brass Mill' private house). The Grade II listed Saltford Brass Mill (25) was one of a series of mills working in brass in the Avon Valley during the eighteenth century. The earliest main process involved the shaping of brass sheet into hollow-ware vessels, such as pans, bowls, and vats. Large water-powered hammers were used originally, to beat brass ingots into sheet, and then faster hammers shaped the sheet into hollow-ware. This beating process was known as 'battery', so Saltford Mill was known as a brass battery mill. It is difficult now to imagine how much noise the mill must have made; the constant and regular banging would have been a dominant feature of village life. The mill ceased production in the 1920s. For more about the Saltford Brass Mill see www.brassmill.com. 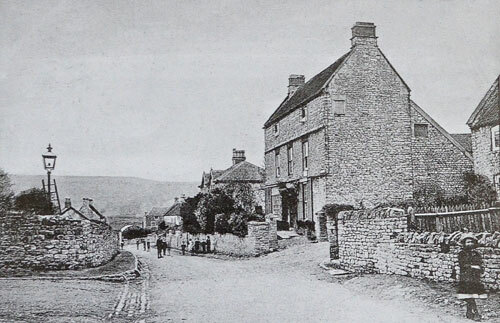 Roughly opposite the Brass Mill there was once a terrace of three cottages known as Flowers Cottages, now demolished. 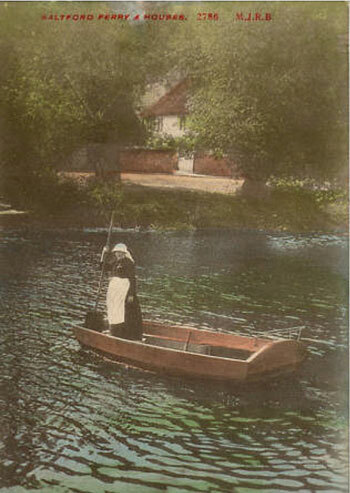 In one of these lived the ferryman, Charles Gregory, and his wife Hannah. We'll come to the ferry-point shortly. A little further on to your left (26) is a building that was built in 1866 as a Methodist chapel at a cost of £200, and opened by WD Wills of W.D. and H.O. Wills of tobacco fame. In 1930 it became the village Working Men's Club. It is now a private house. After you have passed a row of terraced houses on the left you will see a public footpath coming down steps (Granny's Steps or Granny Brookman's Steps) from the hill on the left (27). This marks the spot on the river where the passenger ferry used to cross to the opposite bank. If you look across to the other side you can see where the path led up from the ferry crossing and under the old railway (now the Bristol to Bath cycle path) on its way to Kelston. A photograph of Hannah Gregory navigating the ferry across the river is shown here. Hannah operated the ferry from 1886 to 1908 as her husband had 'the palsy'. Clevedon Civic Society & Woodspring Museum. The buildings here are called Willow Cottages, but were formerly known as Ferry Cottages. This is a Grade II listed building, listed as a 'row of 3 cottages at right-angles to road. Late C17 to mid C18 with early C19 and late C20 alterations'. At the time of the 1861 census, No. 1 was lived in by Thomas Collyer and his wife Ann. They were Primitive Methodists, and held services in their kitchen on Sunday evenings. Thomas was a gardener at the Rectory nearby. The Rector was non-resident, but when he heard that his gardener was a 'ranter' he sacked him immediately. Thomas then became a gardener at Kelston Park. Ann Collyer was a teacher at the school from 1861 to 1875. The couple collected most of the money to build the Methodist Chapel up the road. Return to the car park. The core of the Ship Inn at the bottom of Saltford Hill is thought to date from the 17th century, with the front having had a remodelling. Windmill Cottage (to the east of the main building) is probably 18th century. The Inn was a post for changing horses in the days of the stage coach, and also served as the village post office in the 19th century. The Inn closed in about 1894. An early 19th century toll house built for the Bristol Turnpike Trust in the Greek Revival style. It is described as 'A very architecturally distinguished example of its type'. Another staging inn, the first recorded landlord was there from 1748-1766. The Crown had a barn, stables, outbuildings as well as its own 'micro-brewery', and 30 acres of 'rich arable pasture land'. At the far end of Mead Lane, this inn was built soon after the Avon navigation opened in 1726 to provide accommodation, food and drink for the bargemen. According to the Historic England listing, this farmhouse dates from the early 18th century, with later additions, but a historical survey from 2007 suggests that part of it may date from the 17th or 16th centuries or even earlier. It was originally part of the monastic estates of Keynsham Abbey. 'Weeke House' was originally a tied farm house and the name is thought to derive from the probable payment of a week's harvest to the Abbey as a tithe. The property has recently been renamed 'Saltford Grange'. W3C compliant website. Web page designed and produced by Phil Harding.